RoseMary Odinga in Good condition and expected back next week. - Bana Kenya News, Real African Network Tubanane. Home News RoseMary Odinga in Good condition and expected back next week. RoseMary Odinga in Good condition and expected back next week. The daughter of the former prime minister and Kibra M.P aspirant Rosemary Odinga was flown to South Africa last week accompanied by his mother Ida Odinga and other close members for proper treatment following body disorder as reported by the family doctor. Her father Hon Raila Odinga went to South Africa later to check the well-being of his daughter. The Raila Odinga's daughter is expected to jet back to the country next week following the report released by her doctor and family doctor. The former prime minister is expected to be back tomorrow from South Africa as reported by his spokesperson. The Doctor strike has paralysed many hospitals which led to the death many people and others suffered. 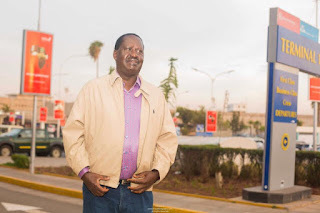 The Raila Odinga family has been in a critical condition following the illness of his Daughter, his step brother and himself in the same week. Raila Odinga was taken to a Karen hospital for food poisoning and later he flew to South Africa to look after his daughter health condition.